Will Bibi’s Return to Favor Help Obama in the Mid-Term Elections? Bibi Netanyahu is on a roll these days. Settler violence against Palestinians? Who notices anymore. Malnourished children in Gaza? Israel and the US took care of that by burying the Goldstone Report. Activists in those pesky Israeli Arab NGOs? Israel has two of their leaders “in custody” right now. (Stories about their treatment have surfaced. Ugly stuff). That flotilla headed to Gaza, which includes the USS Rachel Corrie? Israel has offered to transport the flotilla’s relief supplies from Ashdod to Gaza–after intensive inspections–in very secure Israeli trucks. Would cement to rebuild Gaza make it through the inspections? This is not a security blockade. It is a political blockade. The New York Times admits as much, using language that sounds like an Israeli government press release. Gaza has been under an Israeli- and Egyptian-imposed blockade since Hamas, the Islamic militant group that does not recognize Israel’s right to exist, took over the territory by force in 2007. At the moment, none of this matters to Bibi. Goldstone, Israeli Arab NGOs, Gaza, check points, home demolitions, are trees falling in the forest when no one in the US hears their sounds of suffering. Netanyahu is too busy basking in the glow of Israel’s new membership in the Organization for Economic Co-operation and Development (OECD). You may never have heard of the OECD, but Israel has. “It’s as if before Israel was marketed through Wal-Mart and now it’s through Macy’s,” said Elah Alkalay, vice president of business development at IBI, a Tel Aviv-based brokerage. Israel will be welcomed to the organization, along with Estonia and Slovenia, at a ceremony in Paris that Prime Minister Benjamin Netanyahu plans to attend. It’s one of the first major international organizations that Israel was invited to join since becoming part of the United Nations in 1949. Bibi’s three nation tour includes stops in France (to join the OECD club), Canada (working hard to be Israel’s best North American buddy) and the United States, where President Obama needs Israel’s warm embrace in order to open up AIPAC campaign coffers for the fall elections. Before the prime minister left for Paris, he made sure that the Hebrew language press reported just how happy he was with his friend Rahm’s visit to Tel Aviv. Netanyahu is pleased by the fact that the Americans failed, so he said, to twist his arm and that ultimately, in the duel between him and the Obama administration, he was the one who emerged with the upper hand. We did not make concessions on our red lines and they failed to make us fold and to drag us to places we didn’t want to go, said Netanyahu, according to people who heard him speak. Why would Bibi travel to Washington with such a cocky attitude? Good question, easy answer. Tucked away in Bibi’s coat pocket is a personal invitation to visit the White House, hand delivered by none other than President Obama’s Chief of Staff, Rahm Emanuel. Emanuel was in Israel for a private visit to attend his 13-year-old son’s Bar Mitzvah when he stopped by the PM’s office with the well-publicized invitation. Bibi will get a much warmer reception in Washington than Rahm got on the streets of Jerusalem, where security concerns forced his son Zach to visit the Western Wall alone. What matters to both Bibi and Rahm is that unlike Bibi’s last visit to Washington, this trip will include the customary photo op in the Oval Office, the private lunch, and an understanding with Obama that come September, Israel will resume settlement construction in Jerusalem and the West Bank. 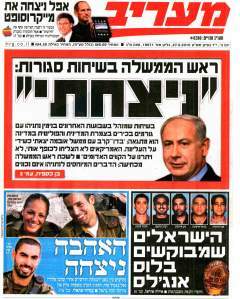 Jerusalem’s Hebrew-language newspaper, Yedioth Ahronoth, views Bibi’s visit in the context of American politics, specifically the 2010 mid-term congressional elections. Since Rahm Emanuel is Obama’s point man on all matters involving politics, what better emissary to personally invite Bibi to “come on over”. According to reports that reached Jerusalem, it is no coincidence that Obama and his staff have suddenly begun to speak warmly about Israel, to compliment it for the good will gestures it extended to the Palestinians and mainly to admit that they had erred by treating Israel unfairly in Obama’s first year. It appears that the Obama administration’s attack on Netanyahu after the publication of the tender to build 1,600 new housing units in Ramat Shlomo backfired. Information that was received by Israeli sources would seem to indicate that the principal reason for the change in approach to Israel is pressure from Democrat lawmakers who are running for election and are finding themselves hard put to enlist Jewish donors to their campaigns. There is a great deal of anger at Obama within the Jewish community and disappointment over his policy toward Israel. Officials in the Democratic Party are afraid that the Jews will take revenge in the midterm elections, which is the reason for the vigorous courting of Israel. In other words, the fear is that the Jewish vote will gravitate away from Democratic candidates to Republicans. As Remez correctly adds, votes are not the primary concern. Rather, campaign contributions are most likely behind Obama’s sudden desire to embrace Netanyahu, in spite of the rising international anger at Israel’s refusal to address its own human rights violations. Nobody knows American politics and fund raising the way Rahm Emanuel believes he does. His formula is simple: You scratch my back; I scratch your back. Bibi is coming to Washington for a little back scratching. His assignment is to loosen a few purse strings among the poo bahs of AIPAC check writers. J Street and the younger Jewish generation which is beginning to question the sacred text that Israel can never be wrong about anything, will one day be able to raise AIPAC level funds. But one day will not be soon enough for the 2010 Congressional midterm elections. 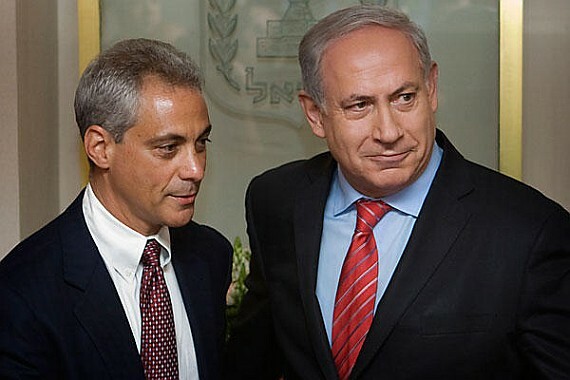 If the Democrats keep their majorities this fall, some of the credit will go to Rahm and Bibi, together again. Unless developments demand it, there will be no Wall Writings postings during the Memorial Day weekend. Over the weekend, I invite you to join me in reading Kai Bird’s personal memoir, Crossing the Mandelbaum Gate: Coming of Age Between the Arabs and Israelis, 1956-1978. The picture above of Emanuel and Netanyahu is by Sebastian Scheiner of the Associated Press.